This is die-cut Blue Ribbon Malt Extract porcelain sign. This particular Blue Ribbon Malt Extract sign is shaped like a can and features a blue ribbon against a yellow background with maroon text. 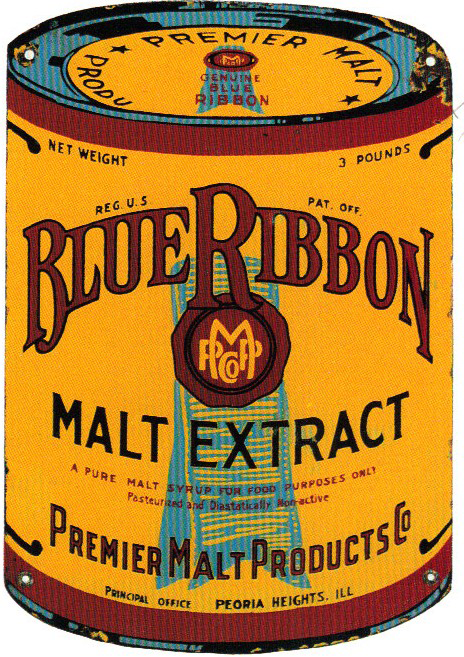 It reads, “Blue Ribbon Malt Extract, A Pure Malt Syrup For Food Purposes Only, Pasteurized and Diastatically Non-active, Premier Malt Products Co., Principal Office, Peoria Heights, Ill”.